Some information about the incident has turned out be wrong. 1.4 UN Monitors Prove "Assad Lied"
"Photographer Marco di Lauro said he nearly “fell off his chair” when he saw the image being used, and said he was “astonished” at the failure of the corporation to check their sources. The picture, which was actually taken on March 27, 2003, shows a young Iraqi child jumping over dozens of white body bags containing skeletons found in a desert south of Baghdad. It was posted on the BBC news website today under the heading “Syria massacre in Houla condemned as outrage grows”. The caption states the photograph was provided by an activist and cannot be independently verified, but says it is “believed to show the bodies of children in Houla awaiting burial”. A BBC spokesman said the image has now been taken down." "The BBC security correspondent Frank Gardner presented images suggesting masses of artillery had moved in the area, leaving “tell-tale tracks.” “All the images were taken on the morning of Saturday 26 May, within hours of the massacre ending,” he reported. One presume that’s relevant, and shows things that hadn’t been there on May 24. They called on military analyst Forbes McKenzie, a former military intelligence officer. He pointed out, in the forested area “H,” what he “believes are the caterpillar tracks left by a mobile artillery battery that fired on the civilian houses.” McKenzie told the BBC: “This would be standard Soviet bloc tactics, firing from woods and then withdrawing.” It took about one minute looking and five thinking to put that claim to rest. 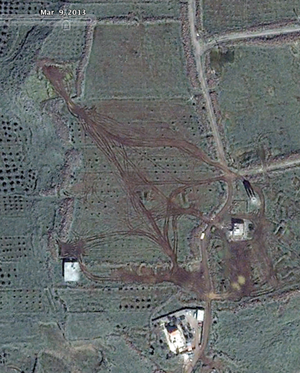 Google Maps public imagery shows the same tracks at a different, earlier time. 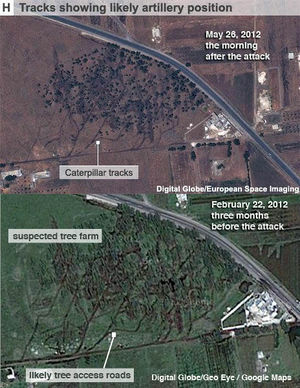 The imagery was taken on February 22, 2012, three months before the attack." At right is the original comparison image, and below is an image that would have looked better for the BBC if it were May 26, 2012. But rather, it's from Google Earth's newly available (as of June, 2014) images from March 2013 - their first update in well over two years! This is an actual army base, the "water Co." - that's a steep slope, but they were by then cruising down closer to the twon on a regular bases with whatever weaponry. The possible tree farm looks the same a year later, but the greenery has obscured those tracks/roads. UN Monitors Prove "Assad Lied"
This hilarious video - perhaps made by off-season, B-list, election year smear-ad pros - was posted and maybe even commissioned by the official SyrianCoalition English Channel, on Youtube, January 25, 2014. Government claim: rebel "terrorists" committed the Houla Massacre. Counter: UN blue helmet investigators went there. The UN then blamed the government. Dramatic stamping animation: Assad Lied. Missing part of that story: Robert Mood's UNSMIS investigators did go to al-Houla, twice at least, in the days after. As Mood said in June, they heard one story from some people, and a totally different one from others. This merited further study, he said, and his report showing that was sent to New York headquarters. The report was buried and ignored, Mood's mission was cancelled just weeks later, and the UN set a different team on the Houla case. (see Ronda Hauben: The UN and General Mood’s Missing Report on Conflicting Accounts of Houla Massacre) The American-Middle-East-expert Karen Koening AbuZaid led the Commission of Inquiry that carefully only considered and spoke to one of those sets of witnesses. From that and various reasoning that's verifiably flawed, this one-sided commission did in fact do all they could to blame Assad. Just about as reliably as a hired smear video editor would. But of course, the rebel video evidence of the day itself, unedited, proves the rebels lied (see Houla, May 25: Who Was in Control?) and the UN's second try investigation helped them out a fair amount. This page was last edited on 10 June 2014, at 12:36.